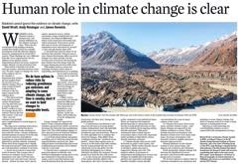 The Dominion Post, the newspaper of record for New Zealand’s capital city, today gave great prominence to an opinion piece by high profile climate denialists Bob Carter and Bryan Leyland titled Hypothetical global warming: scepticism needed1. It’s a “Gish Gallop” of untruths, half-truths and misrepresentations — a piece so riddled with deliberate errors and gross misrepresentations that it beggars belief that any quality newspaper would give it space. I will deal with the factual errors in a moment, but the DomPost‘s lack of editorial judgement extends well beyond any failure to fact check the article. Carter and Leyland’s expertise on the issue is misrepresented. The newspaper’s readers are not given a true picture of their “standing”. They are in fact paid/sponsored propagandists, way out on the crank fringes. Here’s how Carter is credited. Professor Bob Carter is an honorary fellow of the Royal Society of NZ. His expertise is in geology and paleoclimatology — deducing past climates from geological records. He has written several books on climate change. 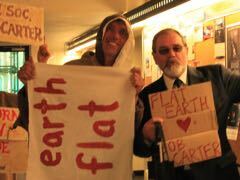 Bob Carter is an Emeritus Fellow of the Institute of Public Affairs (IPA) and Chief Science Advisor to the International Climate Science Coalition (ICSC). In other words, Carter and Leyland managed to con the DomPost into playing along with their propaganda campaign. Bryan Leyland is an engineer specialising in renewable energy. He is an accredited reviewer for the IPCC and has contributed several articles on renewable energy technologies to overseas publications. In fact, Leyland has a long track record of activism against action to reduce carbon emissions. He was a founder member of the NZ Climate Science Coalition and a trustee of the NZ Climate Science Education Trust — formed to bring a court action against NIWA’s handling of the national temperature record. When the case was lost, the trust was folded so that Leyland and his fellow trustees could avoid paying $90,000 of court-ordered costs. Leyland is notorious in NZ media circles for his attempts to push climate denial. It beggars belief that the DomPost did not know about his track record, and went ahead with publishing an article under his name without prominently noting his role as an activist. As propagandists, the product that Leyland and Carter are pushing is doubt — a tactic first used by the tobacco industry, but since refined by fossil fuel interests keen to avoid emissions cuts. Leyland and Carter “win” every time a mainstream media outlet gives their views credence by giving them prominence. Newspapers do not regularly provide platforms for cranks, but that is exactly what Leyland and Carter are, as we shall see in a moment. But Bryan Leyland, from the New Zealand Climate Science Coalition, said science had shown global temperatures had not risen in 16 years and the world was more likely to get cooler. Leyland, as we discussed at Hot Topic recently, is now happy to align himself with the über cranks who deny the reality of the greenhouse effect. Quoting him on climate research is about as meaningful as seeking the flat earth society’s opinion on orbital mechanics. For that stupid piece of false balance, Tom Hunt and the Dom Post win my inaugural Media Fossil Fool award. Anyone care to design a nice badge they can wear with shame? In this guest post, first published last week in the Dominion Post, Jim Salinger looks at the long term temperature record for Wellington, and how it has been constructed. Jim’s currently the Lorry Lokey Visiting Professor in the Program in Human Biology at the Woods Institute for the Environment at Stanford University in California. Climate scientists want to monitor how climate is changing and global warming progressing. This is particularly pertinent as this week the New Zealand Climate Science Education Trust are currently being heard in the Auckland High Court to try to persuade a judge to invalidate New Zealand’s temperature records which have been compiled and collected by the National Institute of Water and Atmospheric Research and the former government agencies. The coalition asserts the only way NIWA can claim a warming trend of 1°C over the past century is by cooking the books. This century climate scientists are very interested in tracking climate as human factors are going to be the dominant influence on climate this century, save a meteor crashing in to the planet. They are interested in adjusting the readings as though they are taken from one location in an area. Wellington has one of the longest and best climate records of any region in New Zealand. This is why climate scientists carefully adjust temperature records. When Sir James Hector, Director of the Colonial Museum in Wellington in the 1860s established a network to monitor New Zealand’s weather and climate, the primary stations were established for weather forecasting, so the priority on permanency of location of a climate monitoring site for climate change was lower. However we are indebted to Sir James’s Scottish heritage as in setting up the network he purchased precision thermometers which were housed in Stevenson screens to ensure consistency. Observations were taken under standard conditions, in his words ‘rigorous….’. This has given us a legacy of climate monitoring under rigorously enforced methods with very reliable observations from the 19th century, the envy of many countries.